Black forest cake is one of the best-known German cakes (Schwarzwälder Kirschtorte). It consists of Kirschwasser flavored chocolate sponge layers, cherry filling, whipped cream and ganache. 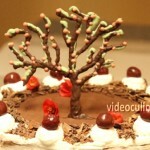 Black forest cake has a phenomenal flavor combination; it is an incredibly delicious and impressive cake. 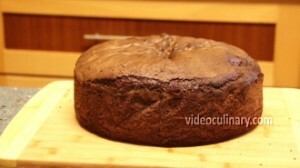 Make the chocolate sponge: Lightly coat a 26 or 28 cm (10 or 11 inch) cake pan with butter and line with parchment paper. Combine seven eggs, seven egg yolks, 450 grams (16 oz) of sugar and 10 grams (2 teaspoons) of vanilla sugar in a bowl. 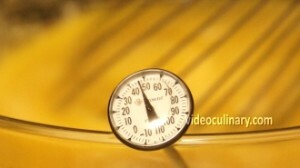 Set over simmering water and whisk constantly until the mixture reaches 45°C (110°F). Heating the eggs and sugar before whipping helps the mixture achieve maximum volume and creates a more stable foam. 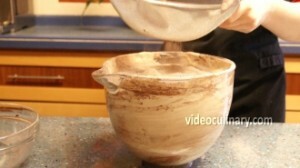 Remove from the heat, transfer to the mixer and whip on high speed, using the whip attachment, until light and fluffy. Whip for another 10 minutes on medium speed. 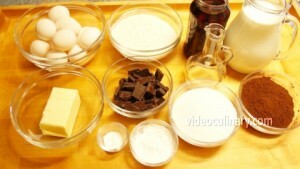 Mix 350 grams (12 oz) of flour and 70 grams (2.5 oz) of cocoa powder. Sift into the egg mixture in three batches, folding gently. Melt 150 (5 oz) grams of butter. Temper some of the batter into the butter, and fold the mixture into the cake batter. 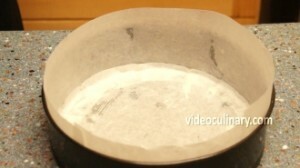 Fill the cake pan with the cake batter and bake at a 180°C (350°F) oven for about 40 minutes, turn the oven off and leave the cake inside for another 10 minutes. An inserted skewer should come out clean. Cool the cake in the pan for a few minutes, unmold, remove the parchment paper, transfer to a rack and cool for a few hours. 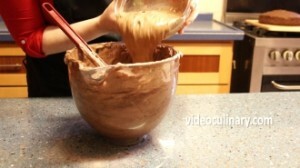 Make the chocolate whipped cream: Bring 500 ml (17 fl oz) of heavy cream to simmer. 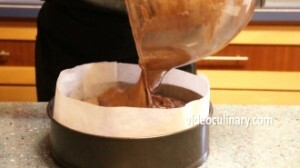 Pour over 300 grams (11 oz) of chocolate, let stand for 1 minute, and stir until the chocolate melts and is smooth. Cover and refrigerate for a few hours or overnight. Make the cherry filling: Drain a jar of cherries weighing 650 grams (23 oz). To make slurry, mix 40 grams (1.5 oz) of starch with 40 ml (1.5 fl oz) of the cherry juice. Combine the remaining cherry juice with 300 grams (11 oz) of sugar and bring to boil. Slowly whisk the slurry into the boiling mixture, and boil for a few minutes, stirring frequently. Turn off the heat and mix in the drained cherries. Cool completely. 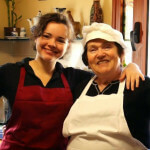 Make the kirsch simple syrup: Combine 150 grams (5 oz) of sugar and 150 ml (5 fl oz) of water in a saucepot. Stir, bring to boil and remove from the heat, cool and add 100 ml (5 fl oz) of kirsch liqueur or rum. Whip 500 ml (17 fl oz) of heavy cream (minimum 30 % fat) with 100 grams (3.5 oz) of sugar on high speed until stiff peaks form. 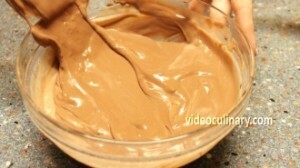 Transfer the chocolate ganache to the mixing bowl and whip the ganache using the whip attachment, until medium peaks form. The ganache whips very quickly. 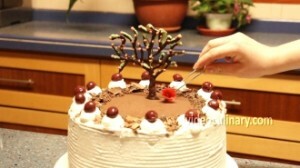 Assemble the black forest cake: Trim any uneven areas from the top of the chocolate sponge. 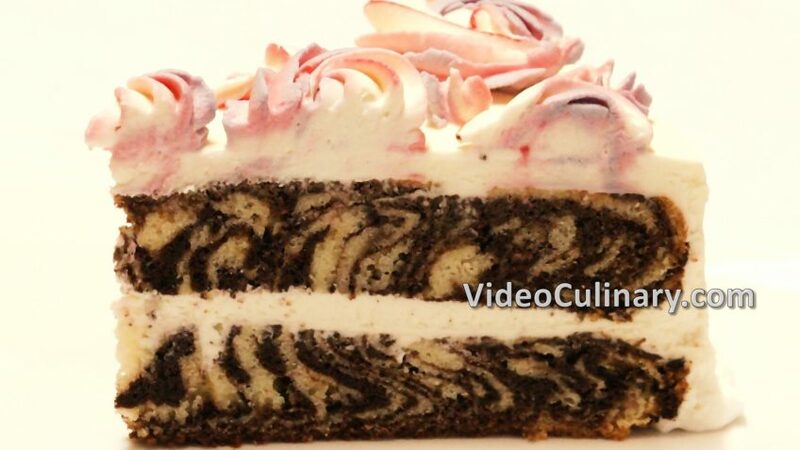 Slice into three even layers using a serrated knife. Moisten the first layer with one third of the kirsch syrup. Use a pastry bag fitted with a round tip to pipe three equally distanced rings of whipped cream. Fill the gap between the whipped cream with the cherry filling. 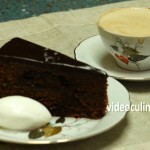 Place a second layer of sponge, moisten with one third of the kirsch syrup and evenly spread ¾ of the whipped chocolate cream. Place the third chocolate sponge layer, flat side up. Moisten with the remaining kirsch syrup. 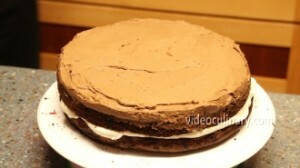 Spread the remaining whipped chocolate ganache over the top layer. 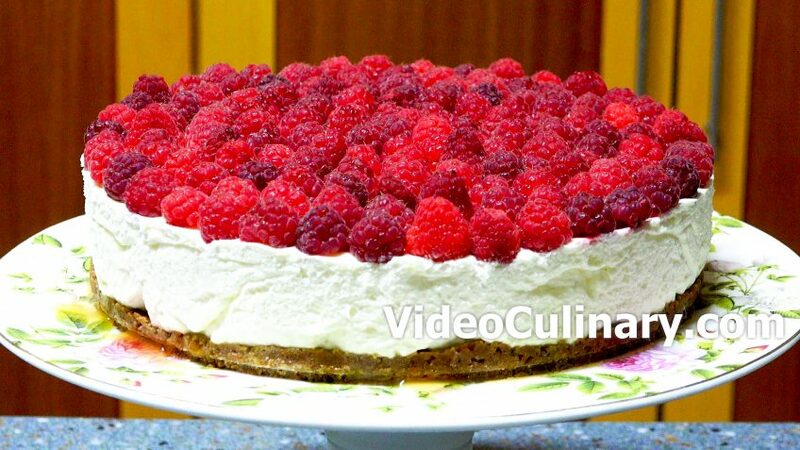 Finish the sides of the cake with the remaining whipped cream, overlapping the top layer. 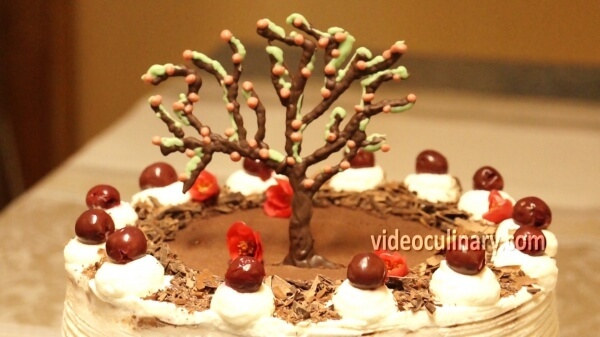 Garnish with chocolate shaving. Use a pastry bag fitted with a plain tip and pipe domes of whipped cream, garnish each with a cherry. 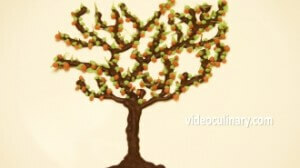 We garnished the cake with this beautiful chocolate tree cake topper. Refrigerate the cake for a few hours. 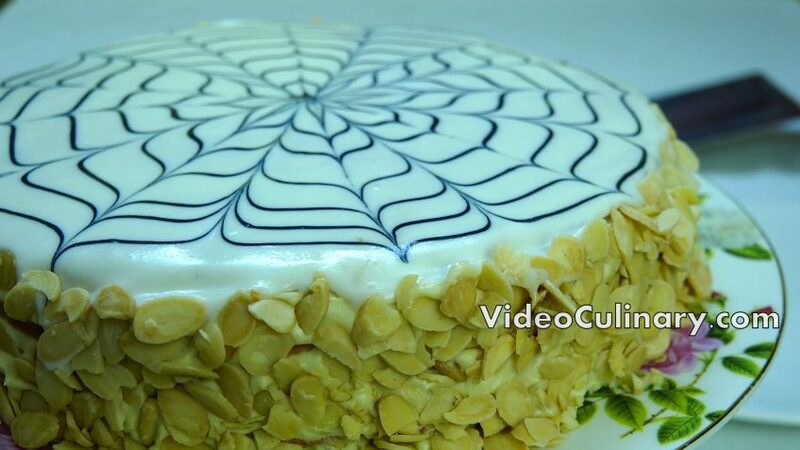 Remove the cake from refrigeration an hour or two before serving. Enjoy it with a cup of tea or coffee. 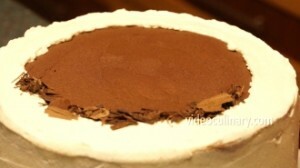 Good luck with your recipe, and please visit our website videoculiary.com for a Tiramisu cake recipe, and more detailed recipes!